Modern industrial asset maintenance and inspection concepts require reliable and accurate inspection techniques. New developments in modern NDT have resulted in a range of screening tools and enhanced mapping techniques, which enable reliable condition assessment during the operational phase of installations. In service inspections allow on stream condition assessment of equipment before planned shutdowns. NDT data is applied to optimise off stream inspection intervals and aim maintenance effort to where it is required most. The result is reduced downtime and increased availability of installations. Modern maintenance concepts, such as Total Productive Maintenance (TPM) and reliability centred maintenance (RCM), demand maximum use of installations at minimum costs, without compromising on safety. The role of non-destructive inspections becomes more and more important for condition assessment to optimise maintenance management. NDT is required during and after construction as well as in the user phase of installations in oil and gas production, petrochemical industry, power generation, food processing industry or other types of production plants. Instead of corrective breakdown maintenance or time based preventive programs, many owners of installation turn to condition based approaches . Maintenance effort should be aimed at those parts, where it is required most. Condition assessment of the actual piece of equipment provides adequate data to optimise maintenance planning. Action can be taken immediately where needed or postponed where possible. Most inspection regimes are not in line with the maintenance requirements, but based on fixed inspection intervals prescribed by governmental regulations. Duration of these intervals is mostly determined historically or based on generic rules for certain types of equipment. These criteria may not always be optimal for a specific installation. Operational integrity of installations should be judged on more individual basis. "On stream" inspections can be conducted in service to provide information about the actual condition of the object. Off stream inspection can be based on the actual condition of the moment and interval duration may be made flexible. In view of condition monitoring programs, it is necessary to establish the baseline condition of any installation. This may be done at any moment in time, but should preferably be implemented directly after construction. In an early stage, one should consider using a type of inspection, which may be applied in an equal fashion in a later stage during service time. Periodic condition assessment allows trending and prediction of the remaining time-to-failure (MTTF). Operational lifetime extension may be agreed upon with authorities and increased plant availability is the result. Inspection planning itself may be optimised to obtain maximum result from as little effort as possible. A study of applied construction and process materials, degradation mechanisms, inspection history and operational conditions allows risk assessment for each individual piece of equipment. Inspection activity is then prioritised based on a number of operational parameters, e.g. operation pressure and temperature, consequential loss, personnel safety, environmental damage etc. Risk assessment for each individual asset leads to a risk based inspection (RBI) approach. Preferably, NDT shall be performed before a planned shutdown, while the equipment is in service. Ample time is then available to plan the necessary maintenance work long before the actual shutdown takes place. Since the inspection work has been done before shutdown and the maintenance work is well planned, total downtime for the installation is reduced. Lifetime calculation models may predict the remaining service time of any asset. These calculations require input data provided by the assets' history and available NDT data. The outcome can only be as reliable as the input. High probability of detection (POD) is required to ensure reliable operation until the next shutdown and low false call rate (FCR) is desirable to avoid unnecessary maintenance work. Accurate and highly reliable data result in a reliable prediction of the remaining service time. The number and methods of inspection are always a trade-off between the minimum requirements for safe operation and the amount of information needed for optimum maintenance management. In a baseline inspection, it is important to establish very accurately the zero condition of a piece of equipment. Therefore, precise methods should be applied, mostly in an off line situation. Dedicated techniques are available for full off stream inspection. On the other side, ISI are faced with limitations such as access restrictions, high temperatures etc. Most on stream methods are considered screening tools, which assess general condition rather than exact defect locations and dimensions. Qualitative techniques indicate trends in condition deterioration but cannot deliver exact quantitative information. In signalling (monitoring) inspection, reproducibility is of high importance. Many conventional ultrasonic methods are performed with hand held probes and results are presented in hand written reports. The influence of the particular inspector on the outcome is significant and hardly reproducible. Mechanised scanning and automated reporting minimise this 'human factor'. Many inspection problems are associated with restricted access. 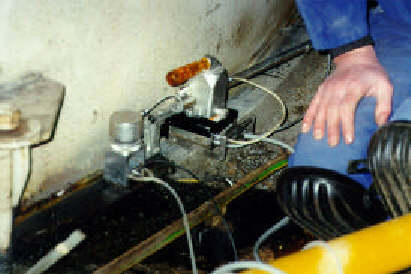 Conventional techniques fail at complex objects or locations that can hardly be accessed such as inspection of nozzles on vessels, tapered pipes, pipework under insulation or on sleepers, under reinforcement or repair patches, etc. New inspection techniques have been developed to fill in the gap in ancient problem areas. Higher operational requirements demand higher performance of construction materials. Nowadays, high pressure vessels are constructed in austenic or duplex steels with internal cladding, special weld materials and buffer layers which are often very difficult to inspect. Another trend in pipeline construction is the use of glass fibre reinforced plastics (GRP). Conventional inspection methods are restricted by the material structure and alternative techniques should be applied. On stream measurements are often faced with high process temperatures. Elevated temperature measurement imposes additional requirements on the inspection equipment. Special ultrasonic probes and couplants are applied for thickness measurements up to 350ºC. Non - contact methods may even go up to higher temperatures. During service time of installations many known degradation mechanisms threaten the condition of the equipment and eventually cause failures. Several phenomena are known to cause problems in the service phase of equipment. Depending on type of equipment, materials, process parameters, service time and external factors, certain types of degradation may occur. It is desirable to understand these mechanisms and anticipate in an early stage on possible consequences. Degradation phenomena may be classified in two groups: mechanical wear and chemical corrosion. Mechanical wear occurs in equipment under cyclic mechanical or thermal loads. Depending on its manifestation and the equipment's function, mechanical wear may be more or less threatening to the operational reliability. Corrosion manifests itself in several forms , which occur in a certain environment in a single form or in a combination of corrosion forms. Many forms may have a severe impact on the integrity of (parts of) process installations. The most common manifestation of corrosion is a uniform attack, caused by a chemical or electro-chemical reaction uniformly distributed over the exposed surface. A combination of a corrosive product and an oxygen containing environment may start corrosion. Environmental factors such as temperature, electrochemical potential etc determine the corrosion rate. Generally, this type of corrosion is of no great concern, since a slow, gradual loss of material is well predictable and adequate measures may be taken. Localised corrosion may be a greater threat to installations, because it may form small pinholes that perforate the material rapidly. Pitting is a result of an anodic reaction process. At an initiation location, the surface is attacked by a corrosive product (e.g. chloride). Metallic atoms are dissolved at the surface of the starting pit. The dissolution causes excessive positive charge in the surface area, which attracts negative chloride ions to restore electrochemical balance. The chloride ions, again, dissolve new metal atoms and the reaction becomes self propagating. Within a short time the pit may penetrate the complete wall thickness. The localised nature of pitting makes it extremely difficult to detect pits in an early stage. Root erosion is a degradation phenomenon, which is often encountered in flow lines. It is difficult to grind the weld penetration on the inside of pipelines. The excessive penetration causes a discontinuity on the surface, which disturbs the flow pattern. On some metals, the wall is passivated by an oxide film, which protects the steel from corrosion processes. Turbulence and cavitation affect the region adjacent to the welds and hamper formation of this passivation layer. Local wash out of wall material at the weld side is the result. Another form of weld root corrosion is caused by selective corrosion. In many corrosion resistant alloys or special welding materials, selective leaching may occur. Removal of the least noble metals results in deterioration of the lattice structure in alloys (e.g. dezincification in brass components). If the weld material is more susceptible to corrosion than the base material, wash out of the weld causes root corrosion and degradation of structural integrity. Under cyclic mechanical or thermal loads, a component may be subject to fatigue. This process is caused by repeated stresses just below the yield point. However, due to stress peaks, microscopic plastic deformations of material structure occur. Under continuing stresses, these deformations result in crack initiations. Mechanical fatigue cracking manifests itself as cracks with preferential orientation perpendicular to the predominant stress directions. Thermal fatigue cracking results in a random web-like crack structure. In combination with a corrosive medium, the fatigue resistance of materials is reduced. 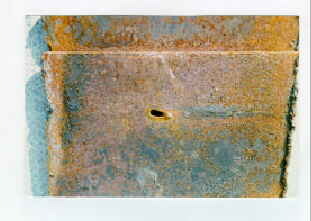 Corroded spots act as initiator of fatigue cracks, which on their turn corrode fastest at the crack tip. This combined mechanical and chemical process is called corrosion fatigue. Crack formation occurs at location where tensile stresses act on the component in a specific corrosive environment. High pressure equipment, mechanical stresses, thermal stresses, remaining stresses from welding processes etc. may initiate stress cracking. After a while, corrosion products in cracks act as wedging forces. A preferably hot, aqueous environment in the presence of oxidizers is an ideal situation where SCC grows rank. Failing cathodic protection may accelerate the process. In heavy duty austenitic materials, stress corrosion cracking occurs mainly along the grain boundaries. This phenomenon, known as intergranular stress corrosion cracking (IGSCC), manifests itself in the heat affected zone of nuclear reactor vessels and piping. With increased use of high definition materials in petrochemical plant work IGSCC may cause problems in process plants as well. Chemical reactors containing hydrogen may suffer from hydrogen induced cracking (HIC). In contrast with molecular H2 gas, Hydrogen atoms penetrate steel reactor walls. Recombination of atoms forms H2 gas, which piles up in voids in the metal structure. Internal pressure increases until blisters build up and cracking occurs. Propagation of cracks occurs often by transitional cracks between two parallel cracks. This process is known as stepwise cracking. At high temperature, hydrogen atoms react with the metallic atoms to intermetallic hydrides. This phenomenon is referred to as Hot Hydrogen Attack, to discriminate from HIC, which merely occurs at lower temperatures. Formation of methane gas (CH4) is caused by Hydrogen reaction with carbides from the metal structure. Besides expansion of the volume and crack initiation, decarburisation of the steel structure results in hydrogen embrittlement, which leads to fast deterioration of structural integrity. With the upcoming of computer technology and miniaturisation of equipment, NDT techniques have developed rapidly into modern highly reliable inspection tools . One of the most important factors is the increased accuracy and reproducibility of data. 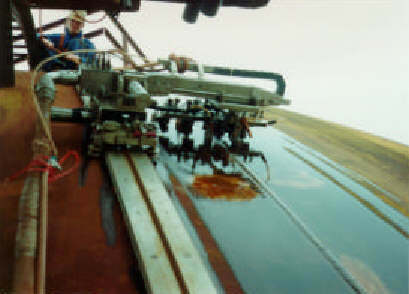 Further mechanisation of inspection techniques improved reliability greatly. One of the main reasons for this is that full coverage is assured by performing the inspection in a mechanised fashion. Secondly, the availability of a complete inspection record greatly improves condition monitoring facilities. In the past, specific probes have been designed to solve known inspection problems. Special focused angle beam compression wave probes have been developed to inspect specific depth regions in a weld. The compression wave concept was introduced by BAM in the early eighties . Dual crystal probe construction and beam focussing techniques enabled high sensitivity ultrasonic examination of complex materials, which could not be achieved with standard shear wave techniques. In austenitic or duplex materials, a well known phenomenon is intergranular stress corrosion cracking (IGSCC). Especially in nuclear component inspection, many studies have been undertaken to find appropriate methods for IGSCC detection. For near surface cracks, special creeping wave probes have been developed. Creeping waves travel just below the surface rather than in it, therefore they are not influenced by the presence of coupling liquids, and the influence of surface irregularities. Moreover, since the creeping wave is a compression wave type, they suffer less from a coarse material structure than shear waves. Another outstanding example is the development of probes focussed under cladding crack detection (UCC). The focal range is calculated in the parent material - cladding transition zone. Cracks initiating from the clad layer into the parent material may be readily detected by UCC probes. Mode conversion techniques and combination of functions lead to minimization of the number of probes required for complete inspection coverage. Tandem transducers with multiple crystals can be build in one housing such as the Round Trip Tandem (RTT) probe or special functions such as Long-Long-Trans (LTT) probes have been developed. Multi crystal transducers combine a number of tasks in one housing to save space in the scanner setup and construction costs. In all cases, it appeared to be of utmost importance that the transducer parameters are optimized for specific jobs. Once having gained experience with a certain weld type however, it is possible to establish a "standard series" of dedicated transducers, with which the inspections can be performed without excessive lead times. Mechanization of the inspection improved inspection accuracy and reproducibility. The Time-Of-Flight Diffraction (TOFD) technique is an advanced ultrasonic inspection technique that fulfils a need for reliable inspections. It is a powerful technique because it can simultaneously detect and size defects. TOFD provides highly reproducible fingerprints of installation, which makes TOFD extremely suitable for condition monitoring . The preparation required for a TOFD scan is minimal, which makes the technique attractive even when only a small number of welds have to be inspected. TOFD may be applied during construction, where time constraints exist. TOFD allows examination directly after welding (up to 200 °C) without hold up of production speed. The acceptance result is directly available. There is practically no interference in continuation of nearby construction works for safety reasons (no radiation shielding etc). Over the past years, the system has been used in a great variety of applications, ranging from circumferential welds in pipelines (including joints of different wall thickness and tapered pipes), weld inspection of heavy wall pressure vessels (up to 300 mm wall thickness). Also, the TOFD technique was successfully applied for inspection of partially filled welds, which are hardly inspectable by any other technique. Nozzle and flange welds (complex geometry) can be inspected with prior computer simulation modelling to aid inspection planning and result evaluation. In contrast with radiography, for TOFD examination only external access to the object is required. In the service phase of process installations and pipework, TOFD may be applied to detect and monitor service induced defects (stress or fatigue cracks etc). 'Fingerprints' of the object are recorded during acceptance inspection of welds directly after construction and periodically every number of years. Initial acceptable defects are monitored and service induced defects are revealed and progressively monitored. Critical reactor vessels with heavy wall constructions can only be adequately inspected by means of TOFD. Other techniques such as high energy radiography with Cobalt-60 sources or portable betatrons, are faced with high safety requirements and extremely long examination times. 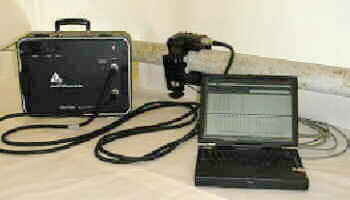 Ultrasonic meander scanning is often too cumbersome and time consuming. Spherical gas tanks and steam generator headers may be surveyed for cracks. Selective erosion/corrosion in flow lines may be detected and sized by regular TOFD inspection. Discrimination between single or two side wash out is easily achieved from the TOFD images. Long stretches of pipeline may be inspected rapidly with minimum preparation needed. Hydrogen embrittlement starts from the internal surface and propagates slowly through the wall material. It is often difficult to detect due to minor changes in structure. A TOFD image can display an increased noise level at the affected location and estimate the degree of attack. The demand for mechanised ultrasonic wall thickness measurement is fulfilled with the introduction of the Mapscan. 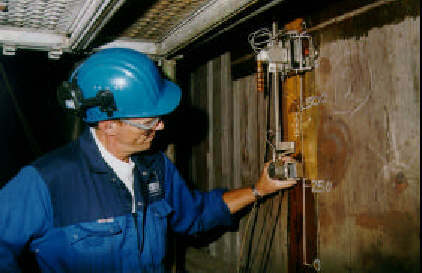 Mapscan applies a mechanical link between transducer and computer to record the thickness data for each predetermined measurement position. The transducer is scanned manually over the surface and the thickness readings are stored on disk. After the scanning is finished, the data are plotted in a wall thickness map. Each thickness level is colour coded and wall thinning by corrosion or erosion is readily recognised. High reproducibility (within 0.3 mm wall loss) enables accurate monitoring and calculation of corrosion rates. This input is very important to estimate time-to-failure. Mapscan is applied on vessels, pipework (bends), tank walls etc, for exact documentation of corroded regions. It can be applied in service at temperatures up to 250°C. Corrosion phenomena such as general wall thinning, pitting corrosion, flow accelerated corrosion (FAC), hydrogen induced corrosion (HIC) and hot hydrogen attack have been revealed successfully by Mapscan. For its high accuracy, Mapscan is accepted au lieu internal visual inspection of vessels. Based on the on stream Mapscan results, off stream inspection interval extension is often accomplished. Ultrasonic mapping techniques prove to be very useful in wall thickness measurement. The same advantages apply for weld inspections. However, ultrasonic weld inspection is executed with angle beam transducers and mapping algorithms become more complex. This problem was solved with the development of projection scanning (in short 'P-scan'). Dedicated scanners enable 3-dimensional presentation of the inspection object. This technique enabled extreme high reliability inspection for monitoring of nuclear reactor vessels. Meander scanning was implemented to comply with existing ultrasonic inspection standards e.g. ASME, AINSI, etc. Regression in construction of new nuclear power plants, meant a reduction in inspection work. Increased inspection requirements in process plants have accelerated a technology transfer to petrochemical equipment inspections. Especially for high pressure vessels and stainless steel reactors higher inspection demands arose. Enhanced scanning equipment has lead to further automation of ultrasonic inspections. A spin off of this development is fast mechanised wall thickness mapping, which in spite of the expensive equipment is economically attractive due to its high inspection speed. Mechanised weld inspection greatly improved accuracy and reproducibility. The development of special purpose probes and focussing techniques opened new ways of inspection. Instead of meander scanning with standard shear wave angle beam probes, the concept of line scanning was implemented in the Bandscan. A transducer frame on a guided vehicle is moved parallel to the weld along a band. Any number of probes can be mounted with different functions. For weld inspection, the cross section of the weld is subdivided in several depth zones, each of which is addressed with a combination of probes. Using focusing techniques, the ultrasonic beam is so narrow at the focal position, that accurate defect sizing is possible, even though only a single line scan is performed. Improved inspection speed and direct sizing capability are great advantages for application of Bandscan rather than meander scanning (P-scan). Especially for large structures, such as spherical gas tanks, Bandscan is the preferred method. Later on this concept was motorized for high inspection speed on pipeline girth welds. Inspection cycles of several minutes in (off shore) pipeline construction can now be achieved with the widely used "Rotoscan" systems. 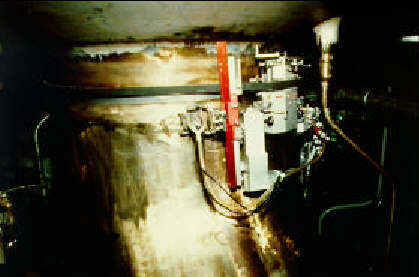 Fig 11: LORUS scanner on the external lid of a storage tank floor. 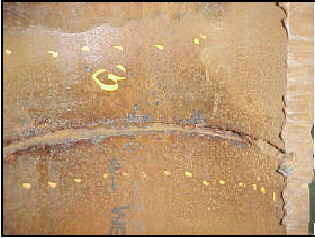 Service induced defects such as corrosion and cracking tend to favour locations where access for inspection is limited. Hidden corrosion is often found with great difficulty or in a late stage when damage is already done. LORUS has been developed as a tool for fast screening of regions with limited access . From a single access point, a range up to one metre may be examined for corrosion or cracks. Inspection may be carried out on stream without dismantling, lifting or opening components, which means substantial savings in shutdown, process interruptions and/or cleaning time and costs. Special design, high sensitivity ultrasonic probes are applied to achieve a considerable inspection range. LORUS measures reflection signals and composes coherent projection images. Examination results are documented in easy to understand, colour coded, 2D top view corrosion maps. Corrosion extent is readily obtained and corrosion growth may be monitored in recurrent inspections Reflection amplitudes provide qualitative information on corrosion severity but can not present actual corrosion depth. An upcoming trend is the use of on stream screening techniques to establish general tank condition. LORUS may be part of a carefully composed on stream tank inspection package, containing Acoustic Emission corrosion activity measurement, and mechanised ultrasonic wall thickness mapping. These complementary techniques provide a firm basis for decision making in maintenance planning and service time extension for storage tank operation. LORUS focuses specifically on the high risk zone of the annular plate, supporting the tank shell. This region is considered critical, due to high stresses and failures may lead to large product spills or endanger personnel and environment. The ultrasonic beam is emitted under the proper angle to propagate underneath the shell and cover a range up to 1 metre. Projection images show the area of the annular plate region in top view and form a permanent document for recurrent inspections. General corrosion as well as localised pitting corrosion is easily recognised. Fig 12: A small strip needs to be prepared for LORUS inspection of a 2 m wide area. Mapping of large objects for corrosion or cracks may be performed rapidly with projection mapping techniques. Complete volumetric coverage is achieved by performing line scanning only. Substantial time saving is achieved compared to full area scanning methods (e.g. Mapscan). In many cases, defect orientation may be such that angle beam inspection is required. Detection of cracks in through thickness direction demands application of angle beam probes. 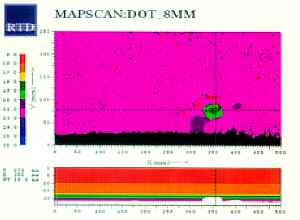 Projection images present colour coded defect maps, with exact defect location and extent. Depth sizing may be by more quantitative techniques e.g. TOFD, at those locations indicated on the LORUS maps. Even locations that cannot be inspected directly because of access restrictions of pipework, repair scales, bandages etc, can be examined by means of LORUS. Minimum surface preparation combined with high inspection speed, essentially provide a rapid and cost effective mapping technique. This method is extremely suited for mapping of cracking, such as fatigue cracking with a preferential orientation or randomly orientated SCC, but also suited for small corrosion pits. Corrosion under pipe supports or saddles is a major problem area for inspection. The region between outer pipe surface and support is susceptible to corrosion due to water ingress. Radiographic or ultrasonic wall thickness techniques are not applicable because of access limitation. The only option is lifting the pipe from the support to gain access. However, the condition of the pipe is the unknown factor and lifting may be a riskful enterprise. With LORUS, the support region is inspected from the free top surface of the pipe without the need for lifting. Fast screening of large numbers of supports is achieved in a minimum of time. Both pulse-echo and transmission techniques are applied in circumferential directions to obtain maximum information. In a single scan over the top surface of the pipe, two probes measure reflection and transmission signals simultaneously. Reflection signals are used to calculate projection images, while transmission signals are used to estimate corrosion severity in several depth classes. Screening tools for fast assessment of large parts of installations seem to have a growing inspection potential. In stead of spot checks, plant users demand complete 100% inspection coverage of their installations. Where conventional ultrasonic techniques, based on bulk wave propagation, have a limited range up to one meter, Lamb waves have the potential of propagating over much longer distances. In a confined geometry such as a pipe, guided waves build up, which can travel over tens of meters. 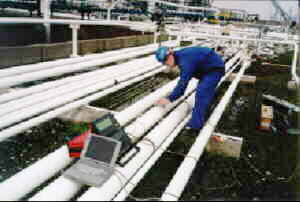 As a screening tool, this technique provides on line information of long lengths of pipework. Guided waves travel across straight stretches of pipes, bends, supports, T-joints, etc but cannot pass across flange joints, end pieces, etc. Ring transducers have been developed , which can generate waves in a specific mode, optimal in range and sensitivity. An extremely long inspection range is achieved for screening of on and offshore pipework, detection of corrosion under insulation without removing lagging other than for application of the probes, road crossings and other hidden penetrations, lined pipework, etc. Since very low frequencies are applied, the defect sensitivity is limited to larger areas of (corrosion) wall loss. Welds cause reflection signals at regular distance, providing reference for sensitivity settings. Internal features in the weld such as weld root erosion may be discriminated in the reflection signal by advanced signal processing techniques. 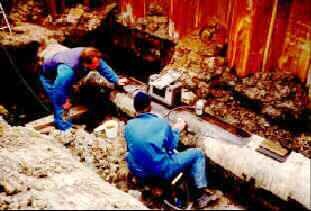 In a similar way, guided wave inspection could discriminate between corroded and unaffected pipes at locations of supports. The full potential of the technique will become evident when it is applied more widely. Advanced ultrasonic techniques show very attractive merits for use on in service inspections of industrial process plants. Most known degradation phenomena may be detected, localised and documented using on stream techniques. Inspection programmes can be optimised to aim optimum effort at high risk (parts of) equipment. Critical components can be monitored and defect grow can be followed in time. 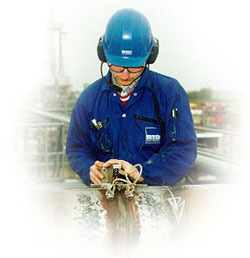 Reliable operational service of equipment can be extended until safety limits are attained. The result of an optimised inspection approach is reduced downtime and maximum availability of installations. Substantial savings are obtained in inspection expenses and secondary, much larger savings may be obtained in cutting operational costs for unneeded maintenance shutdowns. Bouma, T. and de Raad, J.A., 'Time-Of-Flight Diffraction (TOFD), a reliable technique for detection and sizing of defectsÆ, 5th European welding week, 1995.